Has anyone eaten at Glenn's Diner on Montrose right by the Brown line (1820 W. Montrose)? It seems to pack them in for breakfast, but dinners never look crowded. A couple of weeks ago, a colleague asked me if I had ever been to Glenn's Diner on Montrose. "You mean that breakfast joint by the el? ", I asked her. "Yeah, that place", she replied, "But have you ever had dinner there?" . She then explained that the previous evening she and some friends had eaten a terrific and reasonably priced meal there. She raved about the Potato Encrusted Walleye Pike. Being a lover of all things walleyed and spuddish, that sounded right up my alley. So a few nights later, I found myself driving down Montrose at dinner time with a friend in the pouring rain. We passed Glenn's and decided to give it a shot. I double-parked and ran into a liquor store up the street and grabbed an overpriced bottle of the only Sauvignon Blanc I saw (which actually turned out to be excellent). After driving around the block once, we found a parking place right across the street from Glenn's Diner. Glenn's is not really a diner at all. It is more of a typical neo-urban coffee shop/eatery. It is somewhat cavernous with an open ceiling, exposed ductwork and brick walls. The tables are simple cherry wood veneer on iron pedestals. The decor is pretty minimalist. Plain but pleasant. The most prominent feature in the restaurant is an entire wall of cereal boxes behind a counter at the back of the room, which reinforces the whole post-industrial breakfast hall vibe. When we were there, there was some kind of photo exhibit on the walls, but the pictures were dwarfed by the openness and size of the room. As soon as we walked in, we were greeted by the owner from the kitchen door at the far side of the mostly empty restaurant. He smiled and waved, like we were old friends he hadn't seen for a while. I actually had the feeling that I did know him from somewhere. "Red or White?" he shouted. "White" I replied. He yelled back "I'll get a bucket and some glasses", then disappeared into the kitchen. A very pleasant young woman escorted us to a table near the window (isn't it funny how half empty restaurants always seat you in the window). She took our bottle of wine and also disappeared into the back, only to return moments later with the opened bottle in a bucket of ice nestled in a high-chair along with two chilled juice glasses. While she was gone, I noticed the specials displayed on blackboards at either side of the room. With my middle-aged eyes, I struggled a little to read the boards. The one on our side of the room was too close to read and the one on the opposite wall was too distant. I told my partner I should have studied the specials before sitting down, just like I do at Davis Street Fish Market. Then it suddenly dawned on me where I knew the owner from. Back when I used to work in Evanston, he was the manager at Davis Street (when it was still really good). Suddenly, the whole Glenn's Diner dinner concept became familiar. Just like at Davis street, the waitress offered us superfluous plastic encased menus with brass corners, but it was clear that this was also a place where everybody orders "off the board". What was on the boards, looked great. That night, there were 8 or 9 specials. Like at Davis Street, the emphasis at Glenn's was clearly on fish. I can't remember all the specials, but they included Atlantic Grouper, Idaho Brook Trout, "Gonzo" Tiger shrimp (more about them later), Black Fin Shark, Walleye Pike and for meatatarians, a token NY strip Steak. All the entrees were priced at $13-$18, except the steak which was more. There were two appetizers listed, scallops at $8.95 and "The World's Best Shrimp Cocktail" for $9.95, $15.95 or $20.95 (IIRC). Whenever I am confronted with anything that is proclaimed to be the "world's best", whether a cup of coffee or a taco, I have to inquire exactly how that determination was made. Besides, I was a little curious about the three tiered price structure. So I asked the waitress if it was really the best shrimp cocktail on the entire planet, she smiled and replied quietly, "Actually, I'm from Maine". Enough said. However, she did assure us that it was quite good, but unusual. 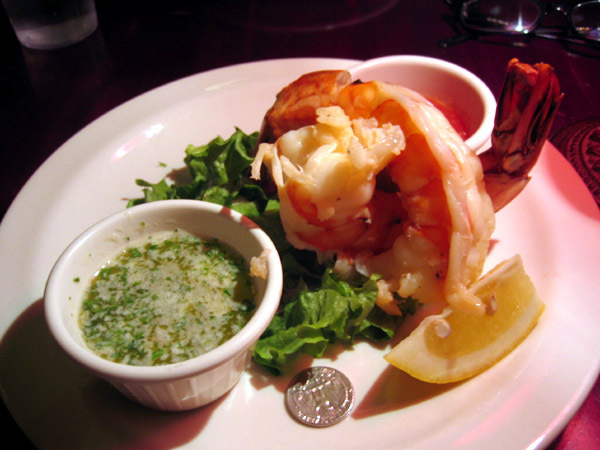 The cocktail consists of one, two or three giant-size prawns, hence the three prices. "One shrimp for ten bucks?" I asked. She held up her hand making a "C" with her thumb and index finger. "They curve from the tip of my finger to the tip of my thumb" she said, tracing the outline of an invisible shrimp. We played it safe and ordered just one shrimp and the scallops. As it turned out, we should have forgotten about the scallops and just ordered the two shrimp cocktail. The scallop appetizer consisted of just four medium size scallops on a plate with a large dollop of mustard sauce for dipping. They were fresh and sweet, but rather unremarkable. What was remarkable was the shrimp "cocktail". It was not a cocktail at all, but a humungous charcoal grilled tiger prawn on a plate with an overly generous bowl of cocktail sauce on the side. The prawn was flavorful and firm, almost to the point of being chewy. The sauce had a healthy dose of horseradish and was a little sweet. I wouldn't call it the "World's Best" cocktail, but it was certainly very good. For our entrees, my companion ordered the Black Fin Shark and I had the Potato Encrusted Walleye Pike. The Shark was a large fist-sized chunk of dense fish which needed to be cut with a steak knife. It had a light Teriyaki glaze with a garnish of crushed pineapple. True to the Davis street paradigm, the sauce was very minimal as were the sides. The emphasis was on the perfectly cooked piece of very fresh fish, which was lightly browned on the outside but still moist and cool at the center. Wonderful. Like I said, the sides were simple, steamed baby green beans and roasted red potatoes. My Walleye Pike was more than I hoped for. In fact, I think it may make my top ten list of favorite indulgences. The dish consisted of a generous thick fillet of pike which was not really encrusted, but smothered in grated potatoes with a strong presence of onions and garlic. The potatoes were brown and crisp on top but still moist and crunchy in a fresh vegetable way. They reminded me of my Russian mother's potato pancakes. In fact, the dish was even accompanied by small bowls of sour cream and applesauce. The crunchy potatoes contrasted well with the moist and tender pike. Although the flavor of the potatoes did somewhat overwhelm that of the fish, overall the combination was fantastic. It was a delightful mash-up of two of my favorite foods. My entree was also accompanied by fresh steamed green beans, as well as a pile of creamy coleslaw. If there was one drawback to the meal, I would have to say it was the coleslaw. It was much too creamy for my taste. Still, it was fresh and flavorful, and I ate it all (the coolness of it went well with the potato fish pancake). For dessert, we split a big piece of chocolate cake ($3.50) which was very moist and way too rich and chocolaty. Even with two of us working on it, we had to leave some. In summary, Glenn's has great food, friendly attentive service, but not a whole lot of ambience. If you want a good piece of perfectly cooked fresh fish at a very reasonable price, but don't care about white table cloths, or mind drinking wine out of juice glasses, then it is a great place to go. In the end, our bill came to $60 including tax and corkage. Not bad for a meal of that quality. I would have happily paid twice that for the same meal in swankier surroundings. I will definitely make Glenn's a regular habit. d4v3 wrote: I will definitely make Glenn's a regular habit. Sounds quite good, and I'm a walleye fan. Seems a visit to Glenn's is in order. Thanks for the thorough write-up! Dave's review inspired us to check out Glen's Diner last week for dinner. We had the potato-encrusted Walleye Pike and the crab cakes (which you can get as a dinner or an appetizer -- we went with the dinner). Enjoyed both. The Pike was my favorite, tasting to me like a fish latke of sorts (I intend that as a complement). My dining companion preferred the crabcakes, which for the dinner portion were 2 generous cakes served with a roasted red pepper sauce. Both dinners came with green beans (the "steamed veggie of the day") and cole slaw, which we both enjoyed quite a bit and didn't find too creamy for our tastes. The pike, as Dave mentioned, came with applesauce and sour cream. Corkage fee is 5 dollars. Our server did not offer to chill our white wine, but I saw another server do so for another table (though to be fair we didn't ever ask). Chilled juice glasses for us too, as with Dave. Our entrees were in the high teens I think, which was the norm for most of the fish specials on the board. They had several other fish specials on the board that looked interesting to us, and I would definitely go back just for the pike and maybe the crab cakes as an appetizer. As others have commented (both on this thread and others), Glen's Diner is kind of an odd space with a pleasantly mixed bag of both food options and clientele. I look forward to going back. Thank you Dave for the excellent write-up. Tuesday evening I went with Josephine to Glenn's Diner, largely on based on this thread and the connection to Davis Street Diner. As recommended we pretty much ordered off the chalkboard. This 8 month old establishment was reviewed just last week in the Chicago Tribune, which obviously pleased the staff. While they had been full over the weekend, it was pretty quiet around 8 PM on Tuesday. Over the Lenten season, I have been on a walleye kick. So why not once again with their hash brown potato wrapped walleye. 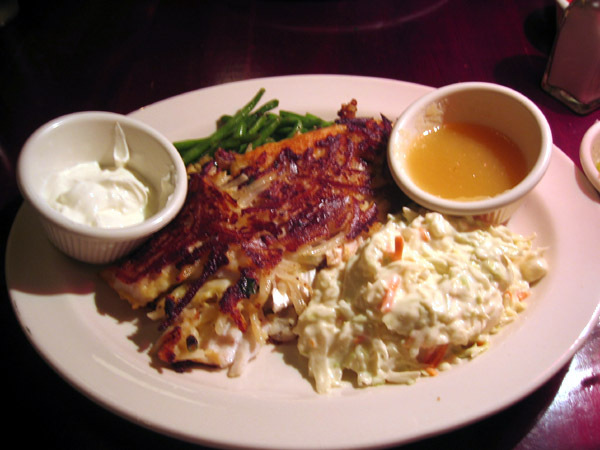 The walleye presentative evocative of the potato pancake was accompanied by apple sauce and sour cream. Cute though absolutely unnecessary because the fish served with the crisp potatoes never needed the applesauce nor sour cream. The cole slaw was a tangy mayo, which seemed to be from a food service rather than made on the premises. A home made coleslaw of the sweet-sour vinegar type seen in Wisconsin would have been perfect. The french green beans were cooked al dente, which I added some garlic butter leftover from our appetizer. 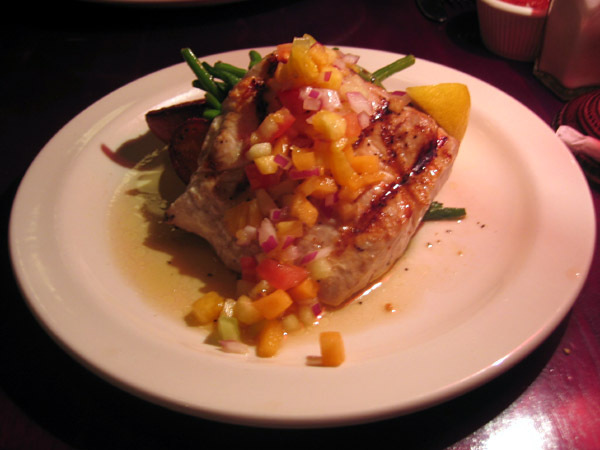 Josephine had the Mahi-Mahi with a mango salsa accompanied by french green beans and pan roasted potatoes. While I recall she commented it was one of the best preparations of Mahi-Mahi that she's had in a long time. I will allow her to explain the finer points of her dish. 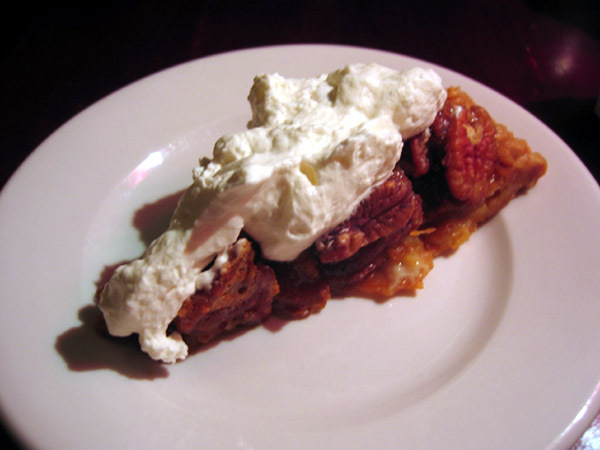 For dessert we split a portion of pecan pie, which given its sweetness was just the right quantity for each of us. The whipped cream was freshly whipped, though a bit too much powdered sugar and maybe more vanilla. This is just personal taste because most would be very happy with their whipped cream. Josephine inquired about soft shell crabs, which brought the sous chef out from the kitchen. He seemed to understand we were interested in live crabs, which they are not yet prepared to offer. They don't yet have a live tank, which requires certificates from various authorities. When he learned it was soft shell crab, he indicated the season would begin in June. This gave us an opportunity to check if the sous chef had any connection to Davis Street. He indicated he has never worked there. I can confidently advise Josephine and I were very impressed with our fish dinners. While we look forward to soft shell season this summer, we will be back before long. I took with me the take-out menu, which features their breakfast and lunch offerings. With the exception of their shrimp-, crab- and catfish-po'boys, there are no fish or seafood on their menu only on the in-house specials boards. Thanks again for bringing this restaurant to our attention. A friend and I tried Glenn's last night. After walking out on the disgusting changes at Davis Street Fishmarket in Evanston last week, I found this site and the good reviews of Glenn's. We tried it out, and loved it! My friend and I had eaten at Davis Street many times, and used to really love it. We were really disappointed when we saw the changes there last week; however when we walked into Glenn's and smelled the lovely aroma, we were both saying "Davis Street who?!"! We arrived at about 8:15, and I was surprised to learn that they closed at 9. Even more surprising because the place was packed, we took the last table. I had the Ruby Red Tuna, prepared very rare; and oh man it was amazing. It came with the steamed beans, and fried potato wedges which were excellent. The tuna was so tasty, perfectly cooked, and sprinkled with fresh ground salt and pepper. Mmmm. My friend ordered the crab-cakes which she enjoyed even though they tasted different from any other crab-cakes she'd had. I think her exact words were something to the effect of "these don't taste all that crabby, but they're really good". Of course we started the meal with the insane shrimp cocktail. The picture above really doesn't do this one justice.. The atmosphere at Glenn's was very comforting, with friendly staff and good service. Our waiter still seemed a little "wet behind the ears" (I think it might have even been his first day), but he was really friendly and helpful. The whole meal felt like you were at a friends place, rather than a public 'diner'. After dinner we ran across the street to Margie's Candies where I enjoyed a delicious ice-cream sundae, and my friend had an ice-cream float. It's a strange little store, but we liked it. I'd like to thank d4v3 and funghi for alerting the forum to Glenn's. Cathy2's forthright good humor improves my appetite without fail. Thanks for the good company, and for the complete coverage of the dinner and the whipped cream situation. The fact that you knew they used powdered sugar in it kind of blows my mind. As Cathy2 mentioned above, I enjoyed my mahi-mahi at Glenn's as much as any fresh fish in recent memory. In fact, it compared very favorably to the mahi-mahi I remember from a Florida trip many years ago as the best ever: tender, moist and flaky. The mahi-mahi forays of recent memory had been rather tough and bouncy, or dried out, and, prior to this dinner at Glenn's, I had come close to giving up on this fish. Another aspect of the dish that I enjoyed was the mango salsa. I have to admit that I ordered it with the semi-perverse expectation that it would be sticky-sweet and ruin the fish. Instead, I was surprised that it added a light and refreshing counterpoint to the grilled filet. Many members of the forum might long for more heat in the preparation of the salsa, however. I will definitely return to Glenn's for the 4-6PM dinner special. For $9.95, you get 1/2# of the catch of the day with soup, salad, and IIRC sides. As always, call first to check on the details. Inspired by d4v3 and JamPhil's posts, and missing Cathy and Josephine by a day, my wife and had a very nice dinner at Glenn's on Wednesday. Same as Cameron I was a fan of Davis Street Fishmarket (please note past tense) and Glenn's has a similar vibe*, though no oyster bar. We were off to a good start when our, friendly, yet professional, waitress, Suzanne, brought an ice bucket, set in the traditional Glenn's high-chair, for our Australian sparkler informing us, prior to popping the cork, of the $5 corkage fee. As advertised, the shrimp were enormous and, if not the best in the world, quite tasty, cocktail sauce was fine, I preferred the garlic butter. Scallop appetizer was terrific, pan seared toasty outside, silky inside, Ellen thought them the best she's had in quite a while. I found the sharp flavored dijon mustard sauce a nice compliment. We had dinner salads with house-made dressing, one with buttermilk Parmesan the other 1000 Island, I'm a sucker for 1000 Island dressing. Greens were a interesting mix, with the obligatory blah Chicago tomato and a slice of cucumber. Actually the salad contained my only quibble of the evening, the croutons, obviously made in-house from various types of bread, were cold, limp and detracted from the salad. I'd suggest a couple of minutes in an oven or pan, to warm and crisp. When Ellen asked Suzanne about the Arctic Char we both really liked her description, "if salmon were beef, char would be veal" Ellen was sold, and the Arctic Char was quite good, as were the green beans. The potatoes were ~shrug~, suffering texture wise from being held. My 'Latke' Walleye was exactly as described upthread, in a word delicious. Crisp potato, moist fish flesh, nice mound of French green beans, well served by a dab of apple sauce and sour cream. This is the dish that will bring me back, and soon. I share Cathy's opinion on the slaw, though I think it was probably made in-house, the overly creamy style did not seem to suite the latke walleye. Daily specials are the way to go, fish in particular. Nice selection of appetizers and there's even an Early Bird 4-6 fish special. Physical space was pleasant, comfortable and greatly enhanced by the lack of techno-drone thumping in background replaced by, what Ellen called, music from the Oscars when they're doing an award presentation for someone who has died. Prices struck me as reasonable for fresh as a daisy fish, and the staff is friendly and professional. I can't believe I live a block from Glenn's...I better get myself in there and pronto! I notice the prices have gone up by $1 or $2 on each dish, just since my review 1 month ago. I thought they were underselling the market. However, Glenn's is still a real bargain, considering the quality of the fish. I love their "no frills" approach to seafood. Gary, you seem to have accidentally posted a picture from your most recent visit to Cereality instead. Just thought I'd let you know how well appreciated LTH is (though you all probably know this already.) Today I stopped in Glenn's Diner with my family -- not to eat -- which doesn't make sense, I know, but our kids had been in a 5K run, and we had promised them ice cream from Margie's across the street, so they didn't want real food, but I had been to Glenn's a while back for lunch, and wanted my husband to see the place. Anyhow, Glenn himself was incredibly nice to us, though the place was busy and we said we couldn't eat there; gave us menus, took the time to chat with us, etc. Then I mentioned LTH in passing, explaining how I had heard about his restaurant in the first place. "Oh my gosh," he said. "Those people are incredible!" So many customers had come in due to LTH postings, he said, and he gushed about your food photos, saying how great everything looked. He wanted me to thank those responsible, so I said I would, and now am. Obviously your favorable words (and lovely photos) mean a lot to those in the business. Glenn's personal interaction with us, by the way, certainly guarantees that we will be back to his place. And of course, the hot fudge sundaes at Margie's were very tasty; not quite the ambiance of the original, but they didn't spiff up what was a former Fannie Mae outlet too much, so it has an appropriate retro feel. And they have the cool shell dishes just like the original Margie's and the hot fudge is just as good. To top off our nice family outing, we then went over to Architectural Artifacts, which is just so much fun to explore. I've finally made my first visit to Glen's and I think the best way to describe the place is "delightful". It's comfortable, easy to deal with, BYOB, and, oh yeah, the food is pretty darn good. I ordered the now-famous potato-encrusted walleye, which was interesting, but I don't think I'd order it again--it was really more of a walleye-encrusted latke. The potato is definitely the dominant player on this plate. I was much more enthused by the simpler dishes I tasted: trout, whitefish, grouper, mongo shrimp appetizer, scallops. Glen's is the kind of place that everyone wants to have in their neighborhood. I'll definitely be back for more. Finally had a chance to stop and try dinner at Glenn's Diner. Very nice. Sturgeon grilled with cream mushroom sherry bacon sauce. . . . hmm, everything's better with bacon and the Colorado River Sturgeon was no exception. Very well prepared. Dining companion had seared Hawaiian Ruby Tuna (?). Cooked rare as requested. Nicely seasoned. It too, was very good. Only other dishes were two house salads. The service was also very pleasant. dan1234 wrote: Sturgeon grilled with cream mushroom sherry bacon sauce. . . . hmm, everything's better with bacon and the Colorado River Sturgeon was no exception. I don't know if it is because I skipped breakfast this morning, but just picturing this dish has my mouth watering. You know, my husband and I went to Glenn's a few times with our three-year-old, both for lunch and for an early dinner and found a lot to like about it. I agree with everyone else's assessment of the quality of the food and the owner and servers are indeed quite friendly. But each time we were there, we had to wait an excessively long time for our entrees and with a child, you really can't do that. So we haven't been back. I was just wondering if anyone else had experienced long waits for their food. Glen's Diner looks absolutely fantastic!!! Time for a roadtrip from the NW burbs! Four of us had dinner at GLENN'S recently and the food and service was terrific.We arrived before 6 and there was a early bird meal for 10.95 that had a choice of two fish entrees which is the best deal in town. After dinner we were speaking with Glenn and he mentioned that on Tuesdays he was going to have an all you can eat crab leg dinner special for 29.95 which should be another great value if it comes close to my last experience. I really hope he succeds in this location because his passion to present great food at reasonable prices seemed to be genuine. I'd like to add some accolades for Glenn's Diner. Went for a late dinner last night with a friend. Skipped the $10 shrimp and each dug into a plate of fish. I got the grouper, he got the lake perch. Both were excellent, and I was pleased that the accompanying red potatoes and squash were perfectly cooked as well. Not delicate, not fancy, but cooked oh so right. I kept thinking during the meal, "This is just a good plate of food." And with a BYO bottle of Protocolo, a pretty reasonably priced one at that. Aaron Deacon wrote: I'd like to add some accolades for Glenn's Diner. Went for a late dinner last night with a friend. Have they started staying open later than 9? Yep, I got there at 9; they closed at 10 on Wednesday. I've had the good fortune to eat at Glenn's three times in the last month. I have to say that their early dinner special is one of the great bargains in the city. Soup (chunky chowder or tomato basil), non-iceberg salad with non-bottled dressing, a nice, utra-fresh hunk of fish, perfectly cooked, along with crispy new potatoes and fresh stir-fried green and wax beans all for $9.95! I enjoyed the salmon and catfish as specials, and didn't regret springing for the sturgeon on another visit. This place has GNR written all over it, and they now serve wine and beer. I saw the notice a couple weeks ago that they had applied for a license. Are they still byob as well? I don't know if they've received the license or not yet, but remember that any place that serves alcohol will likely allow BYOB--it's just a matter of how friendly they are to it (read: higher corkage). Heck, I think Charlie Trotter's will let you bring in your own bottle of wine if you want, but the corkage fee might make you a little light-headed before the wine does. I would suggest that anyone dining at Glen's for a BYO dinner anytime soon to call ahead and check their BYO policy. Let me add my love to the pile. Glenn's is one of the closest restaurants to my new apartment, and I've already been there several times. I actually prefer their dinners to the breakfast menu, but I'm funny that way. Certainly a great choice if you're in the neighborhood and you don't want to do Thai. I was at Glenn's last week. They now have a handful of affordable wines and several beers available. They are still BYO, and our server said they will continue as such--at least for the foreseeable future. I went to Glenn's for breakfast a month or two ago and found it terribly disappointing. The food took nearly 45 minutes to arrive (for eggs and french toast! ), and when it finally did show up, it was cold. They seemed to have an interesting dinner/lunch menu, but the experience was so remarkably mediocre that I really have no desire to go back. jonjonjon wrote: I went to Glenn's for breakfast a month or two ago and found it terribly disappointing. The food took nearly 45 minutes to arrive (for eggs and french toast! ), and when it finally did show up, it was cold. The breakfast and dinner services at Glenn's are very different. It is as if it is two completely different restaurants. If you read the above reviews that concentrate on the wonderfully fresh fish dinners at Glenn's, you will find that both the food and the service have been consistently excellent at dinner time. Since I have never been there for breakfast, I cannot comment on that meal. However, I have heard that it can sometimes be chaotic and slow during the morning rush. You should not completely write off Glenn's based on cold french toast, one of their well prepared and reasonably priced seafood dinners will more than make up for it. I had a wierd issue at this restaurant. They have crabcakes benedict on their breakfast menu, and I love crabcake benedicts, so I ordered it. Their crabcake was amazing. Crabby, with just the right amount of breading and spices. However, the eggs were cold. Poached eggs, cold. I asked the server about this and was told that they make their poached eggs ahead of time and refrigerate. I had never heard of this before. That was a total turn off for my breakfast experience. I have yet to try their dinner, but all things I've read on here makes be believe its a completely different experience.